5 Life Skills a Child Learns in the Playground – What is a Progressive School? One would normally think that a child only develops his gross motor skills in the playground. 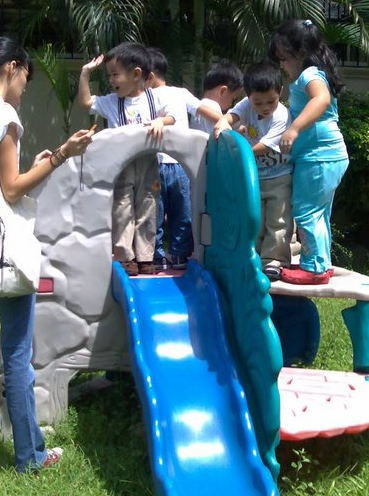 Aside from the development of motor skills, certain life skills or socio-emotional skills are learned in the playground. A child needs to learn to cope with his feelings and he also needs to learn how to respect the feelings of others. The playground is THE place to cultivate such skills. Why? The playground represents the world for a child. How the child relates with other children in the playground reflects how the child relates with people in general. 1. Building Self-Esteem. The best way to build self-esteem is to give opportunities for child to succeed… and to fail. Yup, you read it right — to fail. When a child faces the monkey bars for the first time, fear settles in. He tells himself, “How can I possibly swing from those?”. He tries it and falls on the first bar. He avoids the monkey bars but is faced with it everyday during Outdoor Play Time. And so he tries again and falls again. He then decides to swing in it everyday until he swings on every bar and jumps from it like a gymnast. This is a great teaching moment for the teacher too. Whenever this child faces difficulty in any other school activity, the teacher can always encourage him by saying “Remember the time when you couldn’t swing in the monkey bars?” The child remembers and has more confidence in taking risks, failing, practicing and eventually succeeding. As the song goes, “But I got to pick myself up, dust myself off, start all over again..” I think the writer wrote this in a playground! 2. Connecting with others. Toddlers usually engage in parallel play or playing side by side but not with each other. 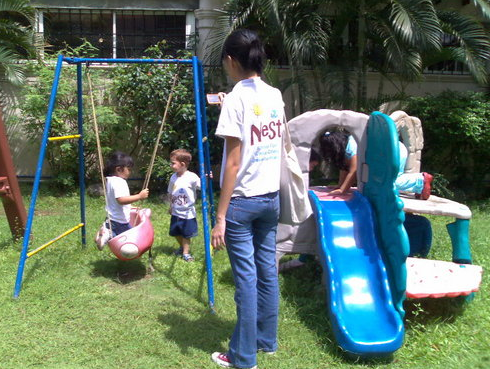 As they grow, they learn to interactively play with other children. They learn to come up to their classmates and ask them to play or join a group in a game of tag. The playground gives such opportunities. 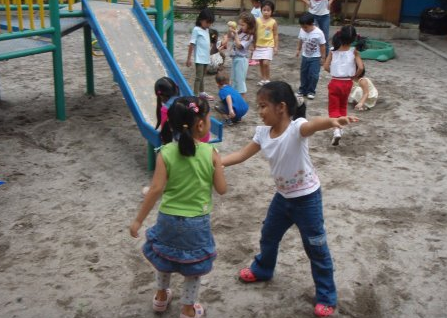 Games usually played in playgrounds require more than 2 children — whether it be tag (or habulan in Filipino), hide and seek (or Taguan in Filipino) or just simply making a sand castle. 3. Resolving Conflict. As in any life situation, conflict is usually present in the playground. This is usually brought about by different behaviors, attitudes and upbringing. Creating the conflict is easy. Resolving it takes skill. And this skill can be learned in the playground. What I love about conflict is it’s the ultimate teaching moment. The goal for conflict resolution is peace. When a child is in conflict with another child in the playground, this can result to the game ending abruptly or the creation of enemies — things that a child does not like to happen. And so to avoid these effects, a child learns to temper down and get along with others. Now how can we teach adults the same thing?! 4. Taking Turns. Oh how the world would change if everyone knew how to wait their turn! This skill should be developed early on. A child comes from an egocentric stage before entering school. He thinks that everything is his and he can use anything he likes at any given time. 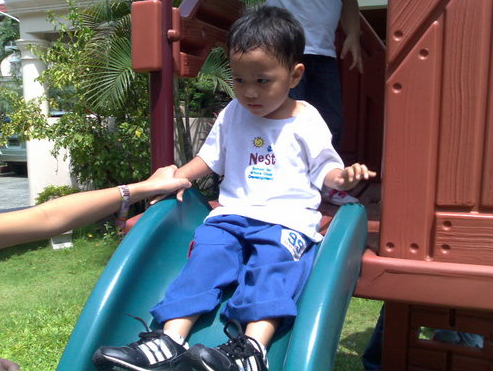 When he plays in the playground with other children, he realizes that there are others who also want to play with the slide, the swing, the shovel, the monkey bars, etc. And so the battle begins.. The progressive teacher then sets the rules of taking turns. What?! The child exclaims. I have to wait?! The teacher then asks him “What if your classmates used it the whole time without giving you your turn? What would you feel?” The child thinks, “I wouldn’t want THAT to happen?” A great teaching moment, indeed. 5. Standing ground. As much as I don’t like bullies, I’m also saddened with push-overs. Upon learning the first 4 life skills, a child needs to reinforce it by standing his ground. Learning to defend one’s self is a skill that every child should strengthen. This prepares them not only for self-preservation but also as an early defensive skill. This also shows how he values himself, his identity and his territory. I specifically injected the role of the progressive teacher in some of the life skills to stress a point. Just because the students are in the playground, it doesn’t mean that the teacher is free to stay in the classroom. The progressive teacher is also in the playground with them to facilitate teaching moments like these. So the next time you see children in the playground, join them. We not only need the exercise, we also need a refresher course on these life skills! 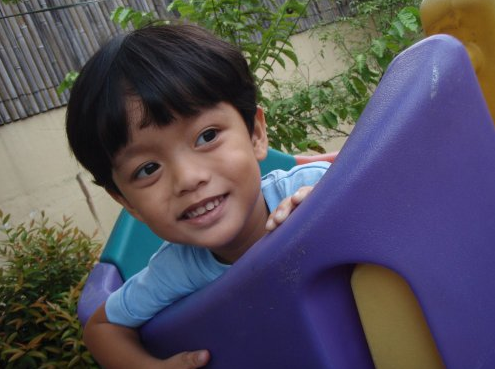 Posted on October 16, 2008 October 16, 2008 by teachertinazamora	This entry was posted in learning environment, Playground and tagged learning environment, outdoor play area, outdoor play time, Playground. Bookmark the permalink. You said it right, Tanya! A teacher will only be effective if he/she is able to play with joy and enthusiasm… like a child. Your articles are really informative. It gave me a great idea in my thesis I am working on in Management and Supervision of ECE Program. My proposed school philosophy is based on Erikson’s socio-emotional and my classroom’s layout are divided into learning areas. Can you please post on how progressive school assess children (assessment plan, progressive card)? Thanks teacher Tina and hoping for your prompt reply. Hi Teacher Lan! I’ll make it my next post! Pingback: Are the students in progressive schools having too much fun? | What is a Progressive School?